Thelonious Searcy (r, seated) listens as his attorney Michael Dezsi plays Vincent Smothers’ confession, taped by private investigator Scott Lewis, into the record. Smothers is on stand with head bowed. Asst. Pros. Thomas M. Chambers is at right. DETROIT – Against his attorney’s advice, former Detroit hitman Vincent Smothers, the confessed killer of four people in the notorious wrongful conviction of 14-year-old Davontae Sanford, took the stand in a packed courtroom today to testify that he, not Thelonious Searcy, murdered Jamal Segars on Sept. 6, 2004. Vincent Smothers begins his testimony regarding the killing of Jamal Segars March 19, 2018. Searcy has been in prison for 14 years, leaving a young wife and two small daughters behind. He fought his conviction vigorously all along, on a pro se basis, and finally attained today’s evidentiary hearing in front of Third Judicial Circuit Court Judge Timothy Kenny, his trial judge, after Smothers’ confession surfaced. 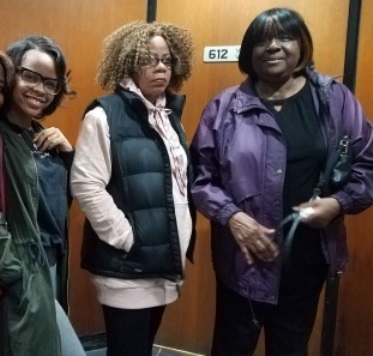 “I’m really happy and excited,” Searcy’s grandmother Edna Richardson said. “I really do believe he’s going to come home.” Richardson has played a key role in Searcy’s battle, hiring private investigator Scott Lewis and maintaining her grandson’s records at her home. Searcy’s daughters said they were thrilled, but nervous at the same time, hoping that the hearing will result in their dad’s release. Searcy’s court-appointed attorney Michael Dezsi said he was astonished when Smothers took the stand himself. He said Smothers’ attorney Gabi Silver earlier advised him to take the Fifth Amendment instead. Dezsi had planned to have private investigator Scott Lewis testify about the taped confession he took from Smothers in his place. 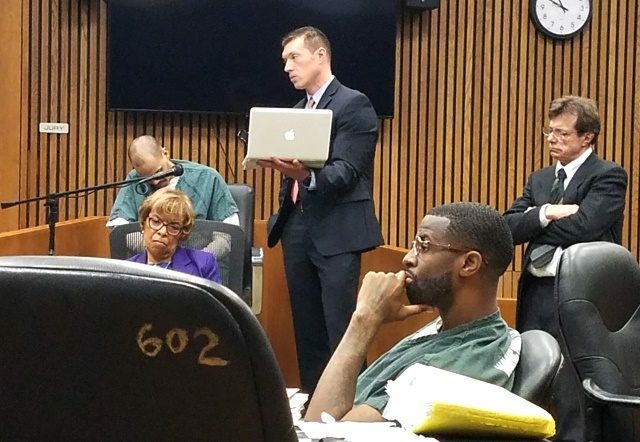 Silver appeared briefly in court, then left while her client told the story of his murder of Segars during a Labor Day weekend “Black Party,” consisting of hundreds of cars packing Conner and Gratiot Avenues by City Airport. Smothers said the killing was not a hit. He said cars were stopped bumper to bumper when he approached Segars, an alleged drug dealer, from behind on foot. Smothers said he shot Segars multiple times until he got to the driver’s side door, where he took several hundred dollars Segars was holding. Smothers said he had an accomplice, Jeffery Daniels, who died about two weeks later in a case involving the sale of fake drugs. He said Daniels only fired his gun in the air once. Afterwards, Smothers said, he gave Daniels both guns to take back with him. Smothers said he lived in the suburbs. 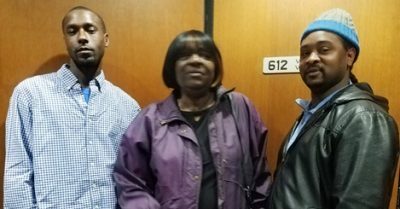 Searcy’ s cousin Richard Searcy (l) and brother Vaughn Thompson (r) join grandmother Edna Richardson. he passenger in the police car got out and began firing at Daniels, but that both he and Daniels managed to get back to their cars and leave the area without being arrested. “Did anybody promise you anything to get you to testify today?” Dezsi asked Smothers. Smothers is currently serving that sentence for the murders of eight people. Wayne County Prosecutor Kym Worthy has never charged him for the four murders she claimed Sanford committed, in an east side “drug house” on Runyon Street in 2007. Searcy’s daughter LaShyra Thomas and grandmother with Edna Richardson. 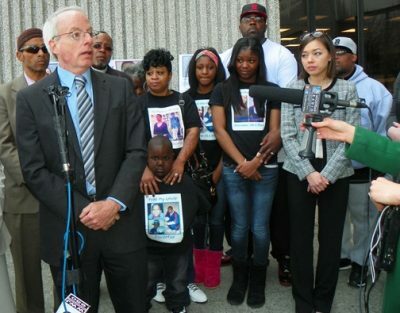 Smothers confessed to Detroit police about those killings shortly after Sanford, 14 at the time, was convicted. Sanford served nine and a half years in prison despite that fact that eyewitness reports initially taken by the Detroit police, and later exposed by the Michigan State Police, showed from day one that he was not the killer. “It’s very hard to do prison time when you’re guilty, but it’s twice as hard if you’re innocent,” Smothers said. He has said he now regrets his crimes and wants the families of the people he killed at least to know the truth. 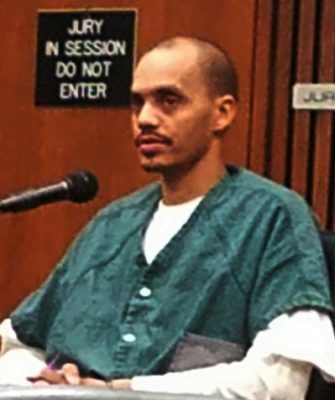 Smothers said Michigan State Police also questioned him about the murder of Jamal Segars while they were re-investigating the Runyon Street murders at the request of the University of Michigan Innocence Clinic. They had Smothers’ written confession to the Segars murder at the time, Smothers said. “They told me that if they got off into that investigation, it would stop Davontae’s case, so I recanted it at the time,” Smothers said. Prof. David Moran (l), who heads the U-M Innocence Clinic, joins the family of Davontae Sanford to announce filing of motion for relief from judgment that led to his release. Professor David Moran, head of the U-M Innocence Clinic, earlier told VOD that it would be “improper for him to comment” on Searcy’s case, as well as that of Charles Lewis, a juvenile lifer with an innocence claim who has served 42 years in prison. Moran sent an unsolicited JPay email to Searcy telling him they could not represent him. Dezsi also introduced into evidence some of Smothers’ numerous prior attempts to let criminal justice officials, including Wayne County Prosecutor Kym Worthy and police, media outlets, and even Michigan Gov. Rick Snyder know that he, not Searcy, killed Segars. Smothers said he received no response from any of those he contacted. In previous stories, VOD has described how he finally contacted Searcy indirectly, sending him a letter to let him know he was responsible for the Segars murder. At today’s hearing, Dezsi had him identify two notarized affidavits he signed in Dec. 2015 for Scott Lewis, including one with a map of the area on which he identified the route he and Daniels took before and after the killing of Segars. During today’s hearing, private investigator Scott Lewis’ taped interview with Smothers about the Segars murder was played over the objection of the prosecutor. Smothers identified it for the record. VOD was the first media outlet to publish this interview on June 10, 2017, after Scott Lewis forwarded it with Mrs. Richardson’s permission. Lewis himself took the stand to testify how he contacted Smothers for the interview, through the warden of the prison where Smothers was located, and also the process he went through to get the affidavits used. Judge Kenny ordered the hearing to continue Thurs. March 22, at 10 a.m., although it is listed on the Register of Actions at 9 a.m. The Michigan State Troopers who interviewed Smothers are among those set to testify. Later, Marzell Black, Smothers’ co-defendant in the killing of Rose Cobb, commissioned by her police officer husband, is expected to take the stand to testify to his knowledge of Smothers’ involvement in the Segars killing. In the mist of a Great Awaking we are face with the Truth being revealed not by discovery. But by the creator himself. It is very uncommon for the Killer to hand over the conviction of FREEDOM leaving the prosecutor and the arresting community with no option but to unleash THE HAND CUFFS. When we have the Justice Fighter’s seeking to REVEAL THE UNKNOWN such as Diane Bukowski, Scott Lewis and You the community it is this kind of ACTION that can turn a WRONGFULLY CONVICTION AROUND. In the mist of a Great Awaking we are face with the Truth being revealed not by discovery. But by the creator himself. It is very uncommon for the Killer to hand over the conviction of FREEDOM leaving the prosecutor and the arresting community with no option but to unleash THE HAND CUFFS. When we have the Justice Fighter’s seeking to REVEAL THE UNKNOWN such as Diane Bukowski, Scott Lewis and You the community it is thus kind of ACTION that can turn a WRONGFULLY CONVICTION AROUND.